Rafael Nadal and Marin Cilic treated Toronto tennis fans to an electric night session on Friday, with the Spaniard edging past an in-form Cilic by a tight 2-6, 6-4, 6-4 decision. The Croatian started the match swinging freely and seemingly belting winners at will. His signature backhand was punishing Nadal cross-court, leaving the World No. 1 at his sixth-seeded opponent’s mercy. Cilic was able to break the Nadal serve twice in the set, and was able to close it out thanks to his own impeccable serving. The momentum would swing in Nadal’s favour in the second set, with the 17-time Grand Slam champion escaping break points in the opening game and race ahead to a 5-2 lead. However, he was unable to close the set out on his own serve as Cilic blasted a clean return winner to claim his first break of the match in six attempts. The decisive set was played on a razor’s edge, with both players holding serve until the tenth game, where costly errors crept into the 2014 US Open champion’s game to set up three match points for Nadal. On the second match point, Cilic sent one final backhand long to hand victory to the tournament’s top seed, earning him not only a place in the Rogers Cup semifinals, but a spot at the Nitto ATP Finals in London as he becomes the first player to qualify. Earlier in the day, 19-year-old Stefanos Tsitsipas booked a spot in his first ATP Masters 1000 quarter-final with a win over defending champion Alexander Zverev on Friday afternoon. The Greek rising star ousted the Zverev in three sets, winning 3-6, 7-6(11), 6-4 in front of a Centre Court crowd. The pair met just six days before in the semifinals in Washington, D.C., with Zverev emerging victorious on route to capturing the Citi Open trophy, but on Friday in Toronto it was Tsitsipas who triumphed. After comfortable taking the first set, Zverev unable to capitalize on a chance to break on multiple opportunities in the second, and a deciding tie-break was needed. 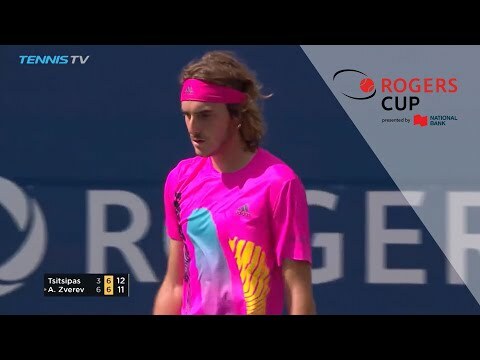 After five set points, Tsitsipas was finally able to clinch and remain alive. With the support of plenty of Greek fans in the crowd, the world No. 27 managed to upset the tournament’s No. 2 seed. He also became the youngest player since Nadal to record three victories over Top 10 players in one tournament, and will achieve another career first as he takes on Kevin Anderson in his maiden ATP Masters 1000 semifinal on Saturday. Other matches on Centre Court included Kevin Anderson’s defeat of Grigor Dimitrov and Karen Khachanov blitzing Robin Haase in an all-unseeded affair. Both Anderson and Khachanov made light work of their opponents, with the South African cruising past Dimitrov (against whom he had a 1-6 head-to-head) and 22-year-old Khachanov ending Haase’s bid to reach consecutive Rogers Cup semifinals with a 6-3, 6-1 rout.